Why pack a sandwich for work or school when you can have a salad instead. 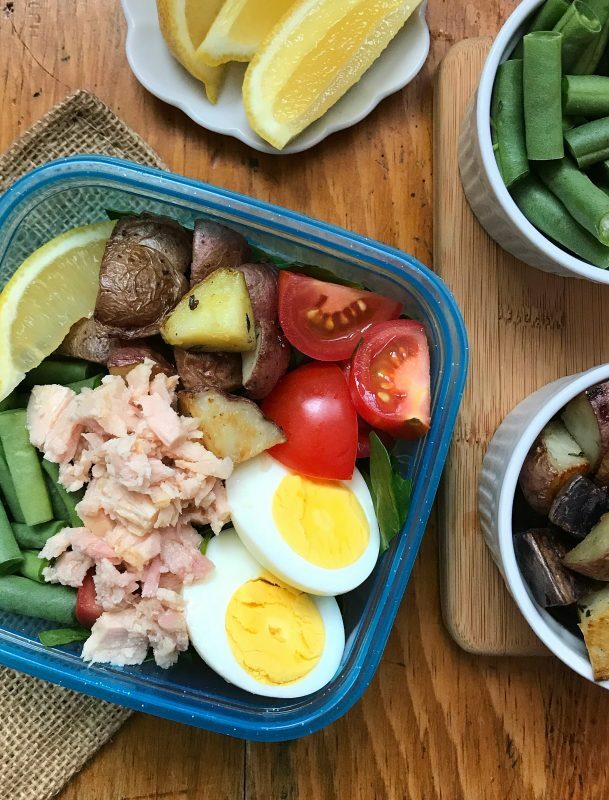 This recipe for Tuna Nicoise Salad packs a protein punch thanks to the tuna and hard-boiled eggs, and it features three vegetables: tomatoes, green beans, and potatoes. It’s simple, satisfying, and always at the ready if you prep it ahead of time. 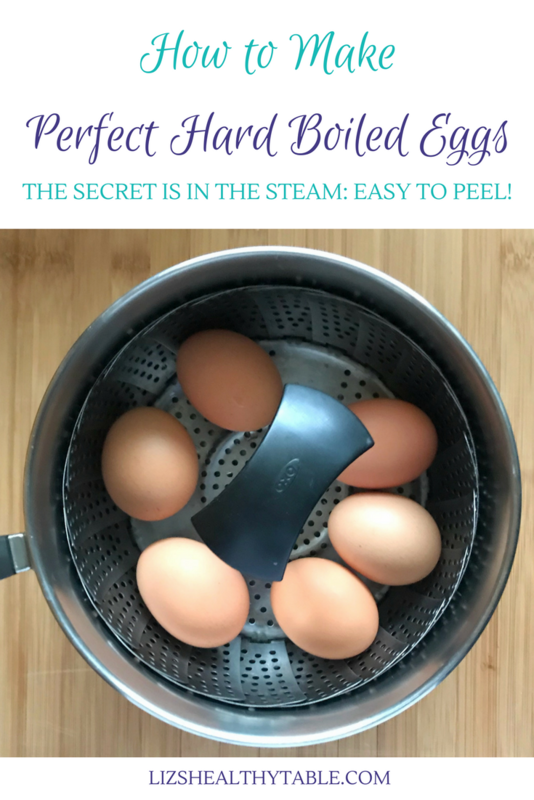 Read on for the recipe and my how-to guide for making perfect and easy-to-peel hard-boiled eggs. 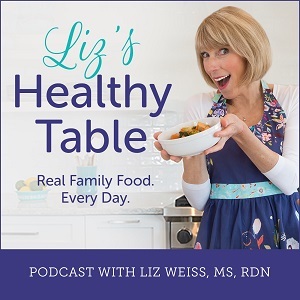 Fellow dietitian and culinary nutritionist, Toby Amidor, RD, joins me on the Liz’s Healthy Table podcast this week to share her secrets for meal prep success. 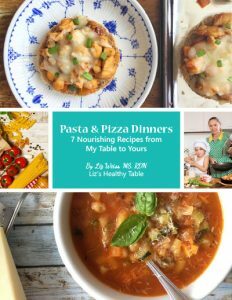 As a mom of three and the author of The Healthy Meal Prep Cookbook, Toby knows a thing or two about planning and prepping wholesome meals. This salad is among the 100-plus recipes in her book designed for grabbing and going, and it’s made with everyday, familiar ingredients. Now, about those eggs. I’ve tried various techniques for hard boiling over the years, but the end result is always an egg that’s hard to peel. I’m sure you can relate. So lately, I’ve been steaming my eggs. The result is a perfect, and easy-to-peel shell every time. 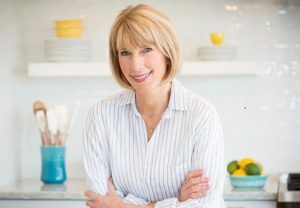 I promise that this technique will lighten your meal prep load! The secret is in the steam! 1. Fill a pot with about an inch of water. 2. Place a steamer basket inside the pot and bring the water to a boil. 3. Turn off the heat, and using tongs, gently place eggs inside the steamer basket. 4. Turn the heat back on, and bring the water to a simmer. Cover the pot with a lid, and steam the eggs for 14 to 15 minutes (for hard boiled). 5. Using those tongs again, carefully remove the eggs to a bowl of cold water. Let cool about 5 minutes. 6. Gently roll the eggs on a cutting board to crack the shells, and then peel under cool running water. The shells will peel off easily (i.e. they do NOT stick) and quickly. It’s like magic! Whether you're packing lunch for work or school, this salad has it all. 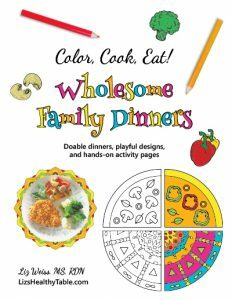 It's ready when you are, and the ingredients are kid friendly, familiar, and nutritious. Tuna and eggs provide protein for staying power, and with three veggies---tomatoes, green beans, and potatoes--this salad is a dietitians dream. I will say that if your kiddos don't love tomatoes, feel free to substitute with bell peppers or carrot coins. Anything goes. Preheat the oven to 350º. Coat a baking sheet with the cooking spray. While the potatoes are roasting, place the eggs in a medium pot and cover them with water. Place the pot over high heat, and bring the water to a boil. Cook the eggs for 3 minutes, then remove the pot from the heat, cover it, and let stand for 15 minutes. 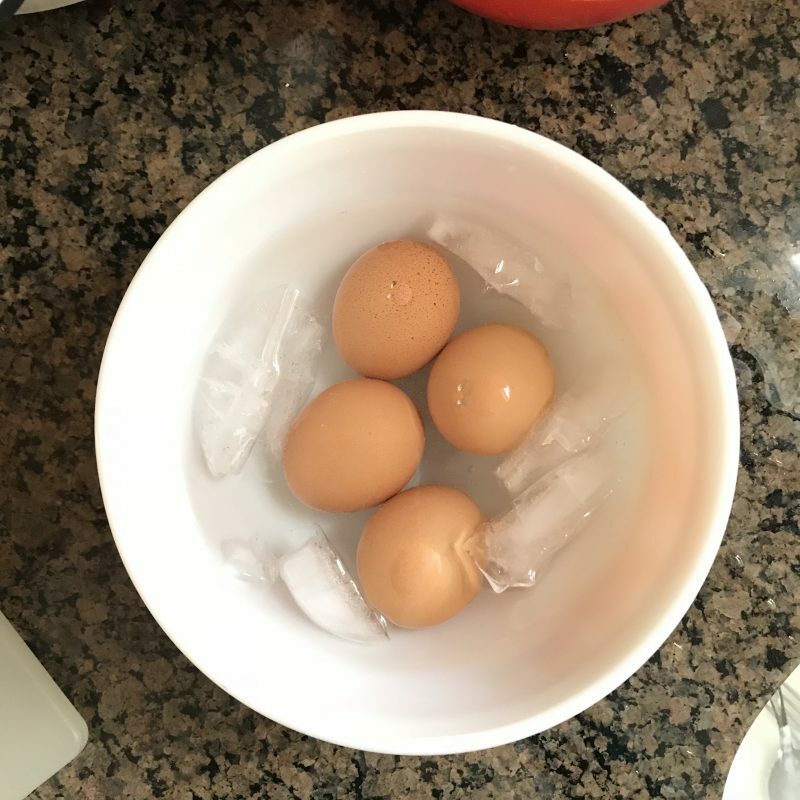 Drain, and run cold water over the eggs until they're completely cool, about 10 minutes. Peel, and slice into quarters lengthwise. Into each of four glass containers, place 1 cup of the spinach. Top each with ¼ cup of the potatoes, 4 egg quarters, ¼ cup each of green beans and tomatoes, and ½ can of tuna with the oil. Sprinkle each with the black pepper, and add a lemon wedge. When ready to eat, squeeze the lemon juice on the tuna. The sealed glass jars can also be stored in the refrigerator for up to 5 days. Are you a pro at meal prep? If so, what are your favorite recipes to make ahead of time so they’re always at the ready? OMG. I clearly need a vacation! This is a perfect on go meal! Easy to prepare with simple ingredients, healthy, and satisfying.